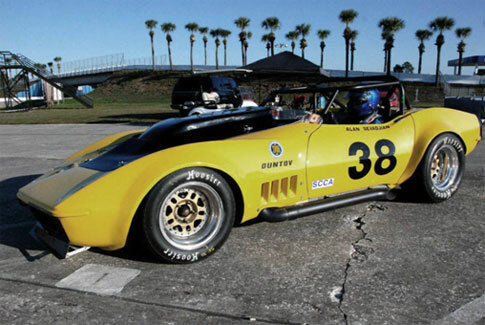 Duntov finishes 1-2 in the SVRA season opener at Sebring Florida. Alan Sevadjian and Jody O’Donnell finished first and second in the hotly contested SVRA season opener at historic Sebring International. 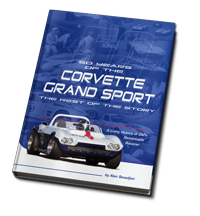 The race was the 49th anniversary of Alan’s first race at Sebring, so he would be hard pressed to argue unfamiliarity! The weather was perfect in central Florida, but perfectly awful in most of the rest of the country. Coming home, it was 80 degrees when we got to the Orlando airport and 19 degrees when we landed back in Dallas. 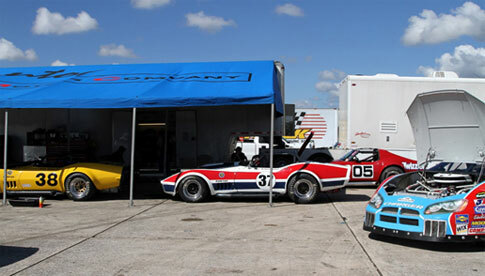 The Duntov team supported 5 cars at Sebring; the now yellow 38 car driven by Alan, Jody’s 2013 National Championship winning black 46 car, Clair Schwendeman’s newly painted red white and blue 37 car, Tony Parella’s red small block Twizzler car and Jody's ex Petty Enterprises number 43 Dodge stock car. As Sebring races go, we had very little car trouble, but with our cars running in two groups, to the crew it seemed we always had someone on track! Qualifying ended up with Alan on the pole by a half second ahead of Fritz Seidel in the 2013 GTO National Championship winning Porsche. Jody was another half second back in third. At the start of Saturday’s race, Jody’s new engine powered him into the lead by several car lengths before turn 1. The order remained the same until Jody’s brakes began to fade and Alan passed for the lead in turn 3. Jody ended up 11th. Clair spun at the hairpin and finished 17th, one spot behind Edward who started at the back of the pack testing Tony’s car. 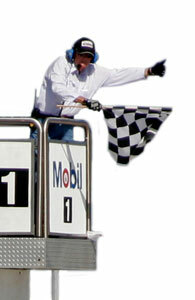 Sunday’s race included three starts, as there were two full course cautions requiring the pace car. Alan led every lap, but Jody got to use his horsepower three times and after the last start he was right on Alan’s bumper with three laps to go. And that’s how it ended. Clair had a great drive from 17th at the start to 7th at the checker. 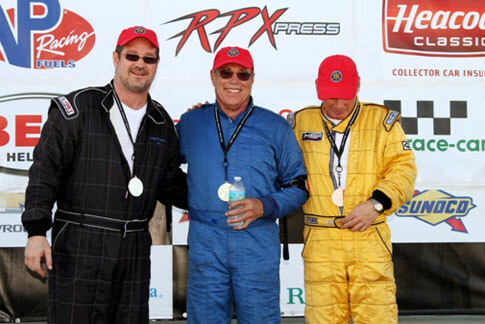 Larry Ligas in his XKE finished an uncharacteristic fourth on Saturday and 5th on Sunday. After Sunday’s race Larry told SVRA Competition Director Ray Snowdon that this was the best and closest racing in Group 6 ever. Larry should know. He has been racing and improving that same Jag in Group 6 since 1990! 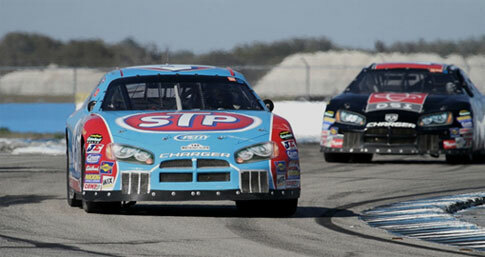 Jody finished third overall on Saturday in his first race in the NASCAR stocker. Unfortunately fuel contamination caused him to miss the race on Sunday. Jody and Alan were happy on the podium; Fritz not so much!